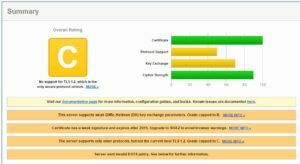 NetScaler Rating at SSL Labs to A+! Steven Wright of Citrix Consulting has released another guidance for getting an A+ NetScaler Rating at SSL Labs (SSLLabs.com) on June 9th, 2016. The good news is that I’ve validated it works- read on to see the proof! Security is very much front-of-mind these days, and fortunately SSLlabs.com has a tool to scan your site, including NetScaler Gateway, to detect known problems against current threats. 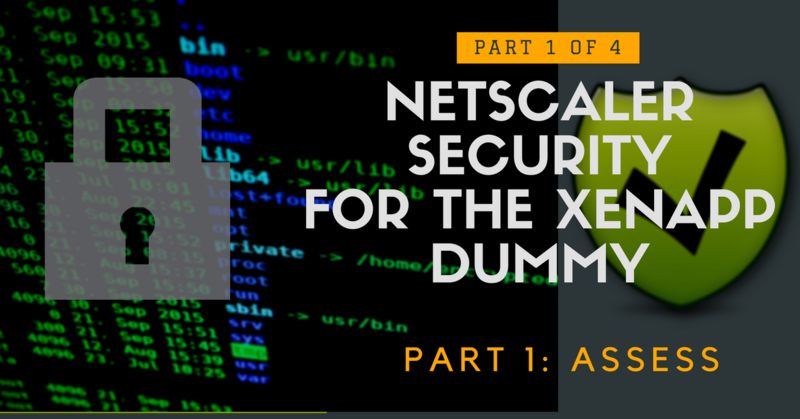 In case you missed it, you have a whole new reason to re-visit your NetScaler SSL configuration, even if it is a VPX which previously didn’t support nifty security like TLS 1.2. This changed after the last round of updates, so you no longer are forced into an MPX to get good security (though admittedly the CPU usage is a bit higher without the offload chip offered in the MPX and SDX platforms). If you are running a NetScaler VPX, your out-of-the-box configuration will likely give you a NetScaler Rating of either an F or a C in most cases. Around here, we go for the big grade- so here’s how to get an A+ NetScaler Rating, even with a VPX. A few caveats that I know of – First off- I don’t really consider myself an authority on NetScaler, so take all of this with a grain of salt and ALWAYS TEST BEFORE YOU GO LIVE IN PRODUCTION. Messing with SSL ciphers can cause outages, especially for NetScaler Gateway. Second, if you need to support older clients, especially Windows XP clients, be VERY CAREFUL deploying all of these settings. You may be stuck with a “C” score for needing SSL v3 to stay turned on in some cases. Even a C rating can still be very secure, this is just how SSLLabs.com rates things even if there’s just one attack vector left (unfortunately, SSL is a big one). Before we go further, I want to reiterate that I’m just validating what someone else created- don’t credit me with this, Steven Wright and Citrix Consulting Services (CCS) did all the work making this possible! Even though I still do occasional work for CCS, I want to make sure noone gets confused! The nice thing here is that the blog article has all the steps you need, so break out that puTTY connection and get started! First things first- note your current rating at SSLlabs.com – I typically do NOT share my results, but feel free if you like to brag. My configuration included a more modern GoDaddy SSL cert with SHA256 and RSA 2048 strength on a NetScaler VPX 200 with the Enterprise license. As I mentioned above- this gave me a NetScaler Rating of “C”. You can test yours by going back to SSLLabs.com and hitting ‘clear cache’ to re-test. Not too bad- a Solid B with this change! I thought it would be an A- but I think there may be a few things in the ECDHE group that will rob you of the rating. You’ll need to define your ciphers manually. Here's the commands to use in the CLI- note that everything in BOLD ITALIC is a name you will need to give it yourself, not a specific command. add rewrite action insert_STS_header insert_http_header Strict-Transport-Security "\"max-age=157680000\""
That’s it! In under 5 minutes, going from NetScaler Rating at SSLLabs.com of C to an A+!!! I anticipate this should work on an MPX just as well, if not better- but I haven’t yet tested it. If you have- comment below with the firmware version you used and your score!